The Shores Holiday Apartments offers beachfront accommodation Mackay. Approximately 12 minutes drive from the centre of Mackay, on the beach at Blacks Beach. A quiet residential area of the Northern Beaches. 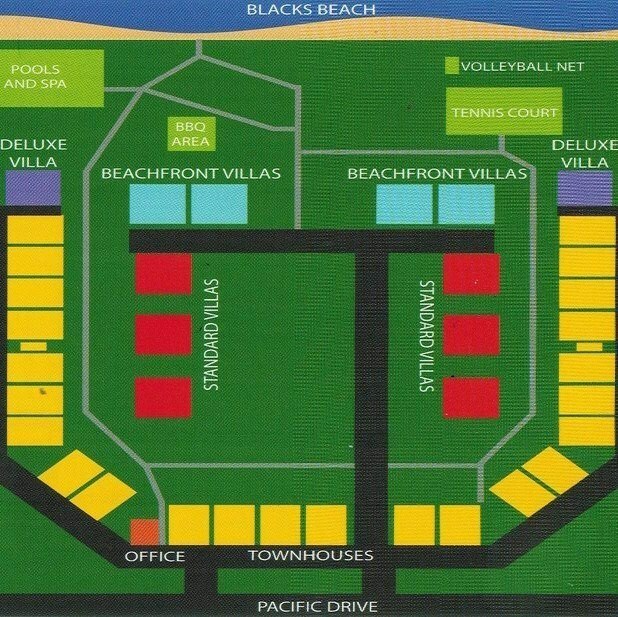 The property layout of The Shores beachfront accommodation Mackay shows the type of units and location around the complex. As a result guests can see just how close the units are to the beach, outdoor recreational facilities and Pacific Drive. The layout also shows the overall size of the property and the green open spaces and gardens around the units. The Shores Holiday Apartments is located in a well established Residential suburb, north of Mackays CBD, but is not easy for some guests to locate as the road network transverses Rivers, Creeks, and the Pacific Ocean. The following information will assist guests to find the property. Travel along the Bruce Highway following the signs towards Townsville. Drive over the Pioneer River, through one set of traffic lights then use the two right lanes to turn onto Mackay-Bucasia Road. Stay on Mackay-Bucasia Road for 6.7 kms. Take the third exit at the large roundabout with the “Welcome to Northern Beaches” sign onto Eimeo Road. At the second roundabout take the 3rd exit onto Blacks Beach Road. Travel 1.9 kms then turn right into Pacific Drive. The Shores Holiday Apartments is 160 metres from the intersection on the left. Travel along the Bruce Highway following the signs towards Mackay. Veer off the Bruce Highway to the left onto Mackay – Bucasia Road. Stay on Mackay – Bucasia Road for 6.7 kms. Take the third exit at the large roundabout with the “Welcome to Northern Beaches” sign onto Eimeo Road. At the second roundabout take the 3rd exit onto Blacks Beach Road. Travel 1.9 kms then turn right into Pacific Drive. The Shores Holiday Apartments is 160 metres from the intersection on the left. Exit the airport turning right onto Boundary Road East. In 300 metres turn right into Milton Street. At the first roundabout take the first exit onto Bridge Road. Travel 1.2 kms turning right onto the Bruce Highway/Nebo Road. Then follow directions for travelling North. A Bus service operate from Canelands Central to the Northern Beaches (Route 307) Monday to Saturday. The closest stop is Chenoweth Drive, Blacks Beach Road intersection. Approximately 7 minutes walk from The Shores Holiday Apartments. If flying into Mackay catch the bus service from Mackay Airport into the City Centre and Canelands Central (Route 303) Monday to Saturday, then change buses at Caneland Central (Route 307) for the Northern Beaches.